The second-generation Eero Home WiFi System is even easier to set up than the first, thanks to wireless access points called Beacons that plug straight into AC outlets. It’s also more powerful, thanks to a new Qualcomm mesh Wi-Fi router chipset and a tri-band Wi-Fi radio. Eero says the $399 kit reviewed here is suitable for a three- to four-bedroom home, and I agree. The router delivered triple-digit throughput in every room of my 2800-square-foot home—more than enough bandwidth to support several HD video streams simultaneously. 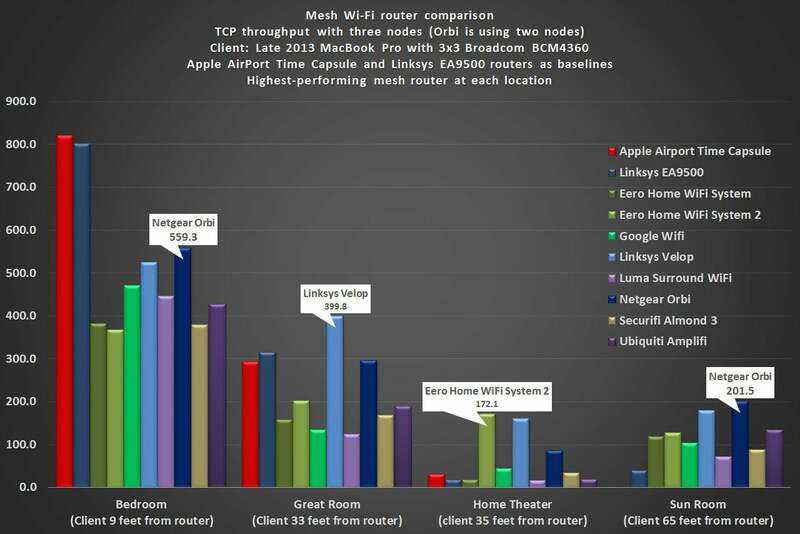 But when you look at the benchmark charts below, you’ll see that while the new Eero (I’ll call it Eero 2 from here) is much faster than the first-generation product, it was the fastest mesh router in the field of eight that I’ve tested to date in only one location in my home, and that was with a MacBook Pro as the client. Interestingly, that location was my home theater, a spot that most wireless devices have difficulty penetrating because of the thickness of its walls and ceiling and the presence of acoustic caulk sandwiched between its multiple layers of drywall. When the client was an HP Envy running Windows 10, the Eero 2 took second place in the home theater. 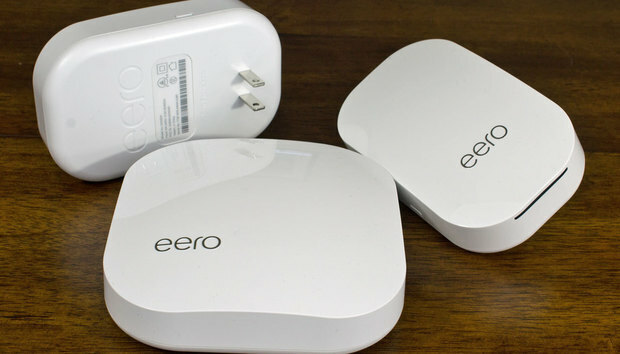 Most everywhere else, the Eero 2 finished in the middle of the pack. The Eero 2 was faster than the original product in every location—with both a Windows and a Mac laptop client—except one: the bedroom, where the clients are in the same room as the router and separated by nine feet of air. The Eero 2's performance is represented by the light olive-green bar. Netgear's router-plus-satellite Orbi wasn't always the fastest, but it was always much faster than the Eero 2. Path lighting? In an access point? Eero’s Beacon—which, incidentally, is backward-compatible with the first-generation Eero router—isn’t a new concept. We first saw it with Ubiquiti Labs’ Amplifi HD, and Netgear has a new Orbi model with a plug-in satellite, too (I have one in my review queue now). Eero’s is by far the smallest and the most attractive, and it has a unique and very thoughtful feature: an integrated LED nightlight. An ambient light sensor on the Beacon will automatically turn the nightlight on when it’s dark, and the light's intensity will scale with the room's light. You can use the Eero app to program it to turn and off at designated times. You can dial the time in precisely enough, but the schedule will be the same for every day of the week, there’s no accommodation for daylight savings time, and you can’t set it to come on at dusk and off at dawn. It’s a cool and thoughtful feature, and it will encourage you to place the Beacons out in the open where they’ll be the most effective. The nightlight isn’t as bright as the one on the latest SnapPower Guidelight outlet cover, but it provides good-enough path lighting. If you find the light intrusive, you can turn it off in the app. The Beacon has an integrated nightlight that adjusts its brightness according to ambient light conditions. The Eero router and the Beacon have another differentiating feature: a Thread radio. Thread is an up-and-coming wireless mesh network designed to connect devices such as thermostats, appliances, lighting, and smart entry locks in the home. 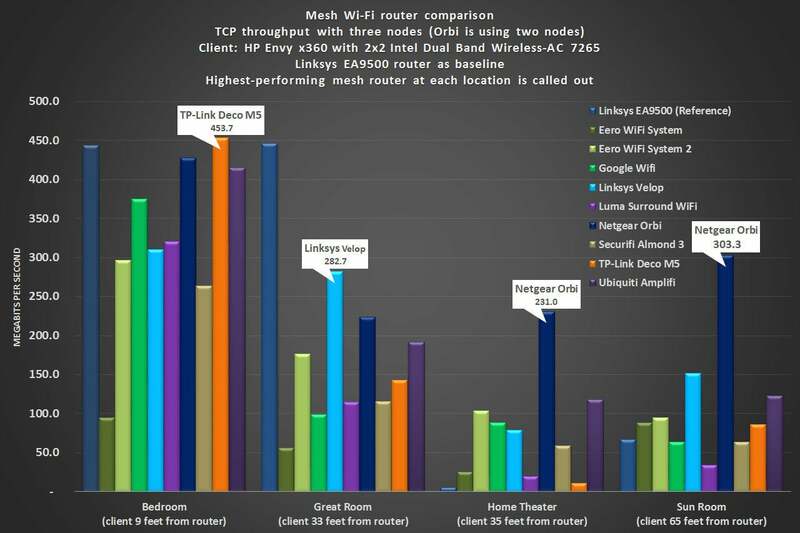 In this respect, it’s similar to the Z-Wave and ZigBee mesh-network technologies that preceded it. Originally developed by Nest Labs—which uses it in its thermostats, smoke detectors, and other products—Thread is also backed by several other heavy-hitters, including Qualcomm (see above), Haiku (ceiling fans and lights), Yale (entry locks), Schneider Electric (lighting controls), and Somfy (motorized blinds, among other things). Thread has lots of momentum behind it, but it hasn’t yet had its day in the sun. In other words, don’t buy an Eero 2 because it has Thread radios onboard. There’s very little practical value in that feature today. The Eero 2 scored a surprise win in my home theater when I benchmarked it with a MacBook Pro. I’m covering this here because I wanted to get the performance numbers out of the way first. If you’re looking for the fastest router on the market, you’ve probably stopped reading by now. None of the mesh routers I’ve tested have been difficult to set up, and the Eero 2 is certainly no exception. Each step is spelled out clearly with easy-to-understand text and illustrations. The app even presents floorplans for different styles of home and lets you specify the number of floors your home has. Based on your choices, it will recommend optimal placement for the router and the Beacons. Each time you place a Beacon, the app will perform a network test to determine how optimal that location is. It took all of 15 minutes to get my network up and running, including providing custom names for each access point. You’ll need an Android or iOS device for setup, however, because there is no web browser interface. The app has a great security feature, too. Once you’ve set up your network, you must log into the app by providing your phone number. Eero then sends you a text message with a verification code that you type into the app to gain access. 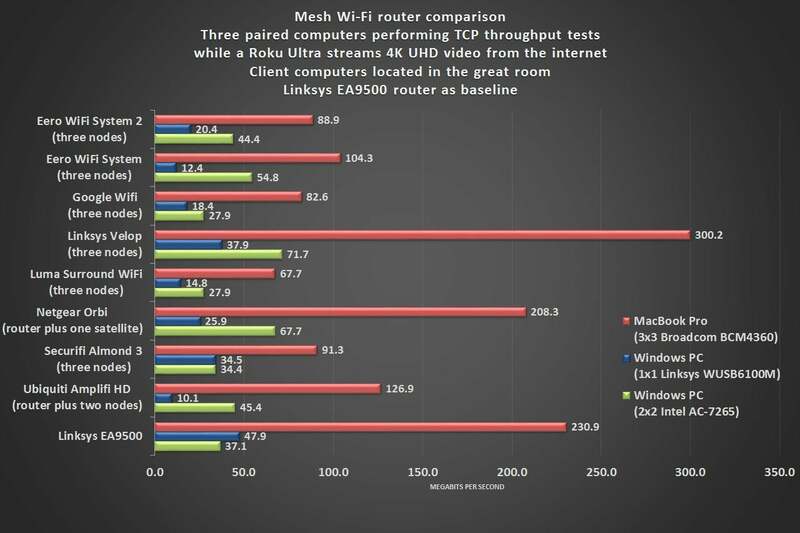 This benchmark chart shows TCP throughput between three pairs of computers while a Roku Ultra streams 4K UHD video from the web to a television. Once your network is set up, the app’s dashboard reports on the health of your network at the top, and the speed of your internet connection at the bottom. In the middle, the app informs you of how many clients are connected to the network. Below that, it displays the name of your network and how many Eero devices it consists of. Tap one of the icons representing the client devices on your network, and the app displays details such as how that device is connected (wired or wireless, and if wireless, which frequency band it’s using and the strength of its connection); which Eero device it’s connected to (an Eero beacon or the Eero router itself); the client’s IP and MAC addresses; and more. A big red button at the bottom of the screen lets you block the client from your network—useful if you discover an unauthorized user. You can operate one guest network, for which a passphrase has already been established. You can edit the passphrase or just push a button in the app to generate a new one. They’re easy enough to remember—one generated password was PapersAirplanes833—but they’re even easier to share. Just push the Share Guest Network button to copy it to your device’s clipboard. From there, you can paste it into a text message. The guest network allows visitors to get on the internet, but they can’t access network files or stream media to devices on the network. If you want to grant a trusted visitor more privileges, you can copy and paste the primary network’s passphrase in the same fashion. Just be aware that they’ll have full access to anything on your network that’s not protected with a login process of its own. Each client device can be assigned a nickname and assigned to a user profile. User profiles tie into Eero’s parental control system, which suffers from all the same problems every other parental control system does. That’s because each device can be assigned to only one user profile. So if you assign the all-in-one PC in the kitchen to your child’s profile, any restrictions you place on that profile will apply to anyone using that computer—including you. Sure, you can whip out your phone and temporarily reassign that computer to your unrestricted profile, but that’s a hassle. And what are the chances that you’ll forget to switch it back again when you’re finished? The Eero dashboard presents all the most important information you need in one screen. 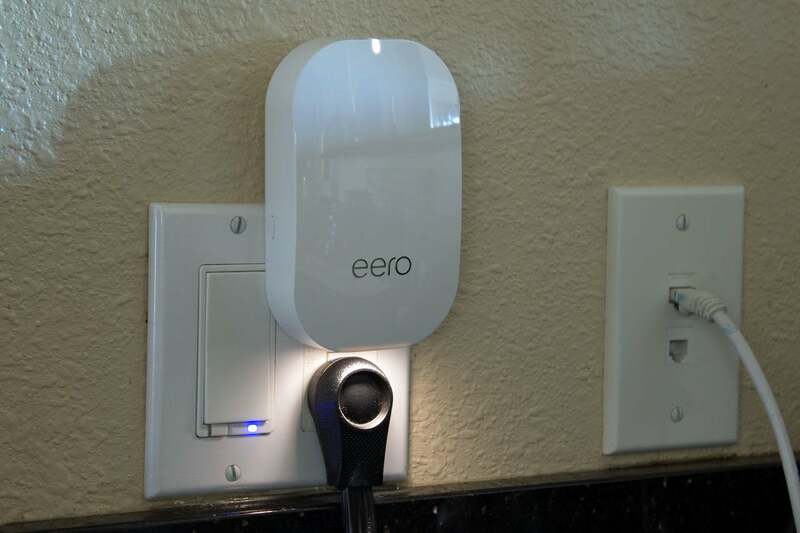 Eero also offers a subscription service that bundles advanced parental controls. One feature, for instance, forces child profiles to use Google or Bing SafeSearch, so search results don’t expose them to adult content. Your $10 monthly subscription ($99 per year) also includes whole-network anti-virus and anti-malware protection. 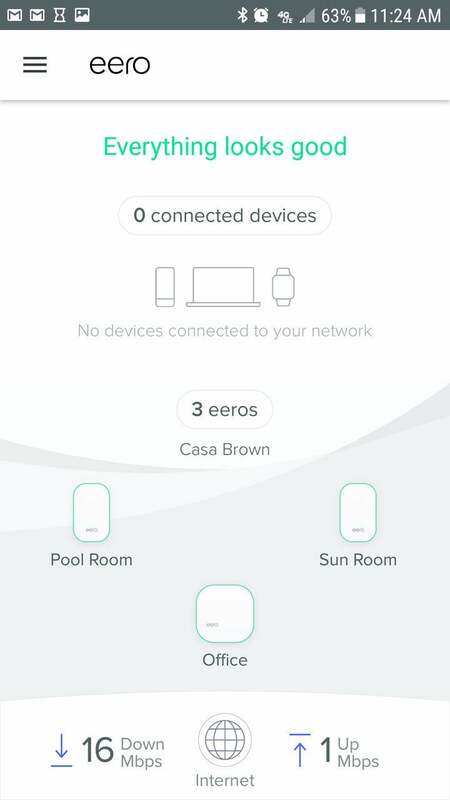 Dubbed Eero Plus, the service entitles you to priority tech support, too (“limited or no wait time,” Eero says). Unlike many of the “user-friendly” routers on the market, Eero doesn’t hide advanced router features from you. You can’t twist every knob and dial in the Eero 2, but you can do things such as reserve IP addresses and set up port forwarding, to make it easier to access network devices from the internet; choose a custom DNS provider; and operate the router in “bridge” mode, so you can run it behind another router if you choose. The second-generation Eero Home WiFi System is attractively designed, easy to set up and use, and very capable. Router geeks won’t be impressed with how close to the metal they can get, but Eero exposes enough of its inner workings to satisfy just about anyone else. I was a little concerned about the Beacons' being so close to the floor, but the antenna placement seems to have taken care of that. And in my test environment, the Beacon in the center of my home was at counter height (because I have a wet bar in the center of my home). The Eero 2’s $399 list price, however, is steep—especially when you can pick up the original, much faster Netgear Orbi Home WiFi system for $50 less. Yes, that buys you a router and only one satellite, but the Orbi was nonetheless significantly faster at almost every location in my home­. On top of that, the Orbi satellite offers the option of hardwired backhaul, if you have the home infrastructure to take advantage of it. To get that feature from Eero, you’ll need to step up to the Eero Pro WiFi system. You’ll get three Eero 2 nodes, but it’s even more expensive at $499. Alternatively, you can buy a single Eero for $199 and configure it as an access point. Single Beacons, meanwhile, cost $149 each. I’m not currently using a mesh network in my home, because I have wireless access points with hardwired backhaul. If I were to switch today, it would be to an Orbi system.